It feels good when a plan falls into place. This time it did, well, almost!! Our hotel was booked in advance, our toy train tickets were booked in advance, everyone gave their contributions on time (after endless reminders though!! ), no last minute cancellations (infact there were additions, Ashfaque and Sauvagya) - unbelievable!! And to top it all, Randhir was joining us with his continuous blast of 'AAI CHAAVLI'. Kya driver daaru samajhke saari diesel pee gaya? Kya toy train 12 dabbo ke jagah 9 dabbon ki chalayi jaane waali hai? Kya Mamata Bannerjee ke white sari aur jordaar cheekhon se train bigad gayi - AAMI SHOTTI BOLCHI!! Go low on the melodrama you jerk, it was only that bhagya ne hammare saath khilvad kiya aur Sauvagya ko Durbhagya se next train ka hi tickets mil paaya. So we tried convincing the TC (Ticket collector) to allow him to come in the 9:20 train with all of us, but the righteous TC showed us the finger of law and order. Dissapointed, Andy and Sauvagya decided to take the taxi, but the Lord worked in a mysterious way and a guy came asking if we needed an extra ticket as his friend wasn't coming and we grabbed it like hungry lions and for those 3 hrs in the toy train, Andy travelled as Abhijit Raikar. Black clouds of smoke arose, the horn blew and our journey commenced in the cute little toy train. The train took a little longer than usual to reach the destination. 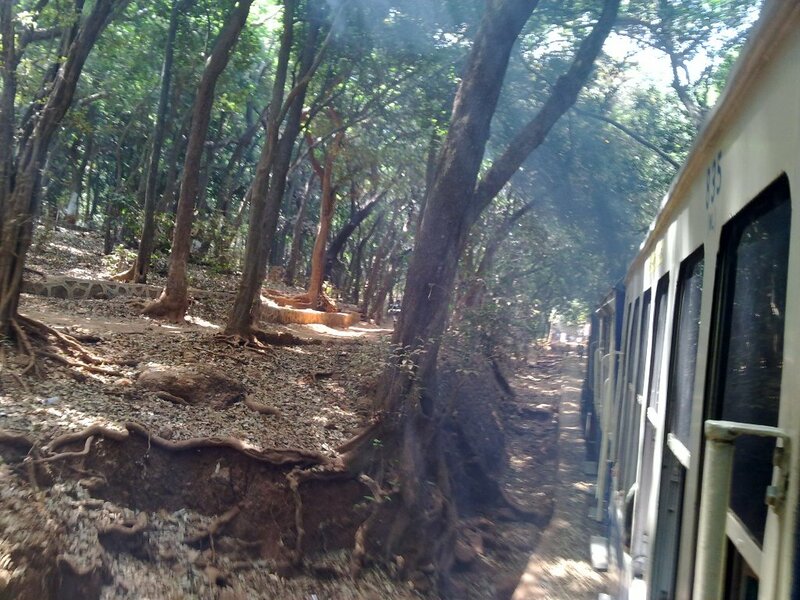 The scenery was good but a little dissapointing to see the brown dryness engulfing the greenery as the train rose up and above to the hills of Matheran. I thought everybody would enjoy the ride like I always do, but i guess for Mumbaites like us who eat, sleep and breathe trains; except for the scenery it was just another train ride; maybe the continuous smell of diesel got on their nerves. 2 of the very enthusiastic guys even went off to sleep!! I enjoyed every bit of it though. While we yelled at the top of our lungs when the train entered the lone tunnel, while we stood at the door and hung outside everytime the tracks and the train turned to get a better glimpse, while we cluttered to see a Ganesh Mandir on the edges of a secluded mountain (Kadyavarcha Ganpati - Nageshs' claim), while we strained our necks outside the tiny windows to capture the moments forever in photographs; the coochie cooing between Mahesh and Randhir never stopped - AAI CHAAVLI, ye kya hai?? Hum bane, tum bane ek duje ke liye?? Sheeeeeee!! There is a tall rock on which a beautiful Lord Ganesh is painted. Keep your eyes open for it, you will see it on the right side of the scenery. Juma Patti station came and we had malai kulfis. Water Pipe station came and we had nothing. Randhir complained of somebody pinching him all the time...AAI CHAAVLI knows who it was. The valleys got deeper and the mountains rose to greater heights as we neared Matheran. Landing at the station, we marched to our destination for the day and night, Hotel Sayeban, in the middle of the market, just behind the Masjid. We had 2 huge rooms for the 10 of us with a verandah too. Feeling hungry, we ordered for lunch (Andys only purpose of the trip!!) immediately and what a feast it was. The food was really yummy, with aloo mutter, chana masala for the veggies and chicken curry for the others. The daal along with the salad was superb too !! Sayeban is a nice and economical place, near to the station, near to the market with a kids play area and lots of swings to laze on. The meals are included in the price of the room. With the sumptuous meal down our tummies and the heat rising, some of the guys pushed off to sleep (what a waste!!) while the rest of us played cricket. We finally ventured out, starting with Khandala point, the nearest to the market area. The mountains and the valleys are always a pleasure to watch. A man with a telescope was probably making people watch others freaking out at the Bushi dam in Khandala. The next on the list was Charlotte lake. Not much of water in the lake, but we saw people (read couples) in abundance. Needless to say, we saw a lot of monkeys and they saw Randhir and said "AAI CHAAVLI, tu idhar kidhar". A visit at the Pisharnath temple was on the agenda. I had looked on the net for some info on the deity but found nothing. So, a little chat with the priest revealed that the idol (Shivling) is a 'Swayambhu'. A cow herself poured milk over the idol and that's how the Shivling gained prominence and a temple was built around it. Offering prayers, we left for the Lords point just behind the temple. From the Lords point you can see the 'Kalvanticha Durg' in the distance. Next was Echo point and boy, it was crowded!! All along we went asking for Cecil point but nobody seemed to know. Having boasted a lot about this pictureque spot, I was hell bent on showing my friends Cecil point but somehow was lost. The Echo point, a little ahead of the Charlotte lake, was swarming with activity. Aunties were hanging on chords doing valley crossing, yelling at the their best. In the near distance, you could see the Honeymoon point and further away the One Tree Hill point which was reserved by us for the next day. Gutsy people were doing the entire stretch (valley crossing) from the Honeymoon Point. It looked scary for the weak hearted like some of us. The search for Cecil (Cilya for the locals) point again begun only to realise that it was the nearest to Charlotte lake. This is really one of the best spots in Matheran and we spent watching the sunset at the edge of the mountain while a group rappelled below. Sight of every chick and hen made our jaws drop and periodic gasps of 'AAI CHAAVLI' came from Randhir. Bachelors broke free, married men were off the leash, eyes wandered, hearts thumped but it stopped at that dirty minds!! At the Charlotte lake, we saw a guy lifting his girlfriend for a pic and Randhir went 'AAI CHAAVLI, te bagh kaay kartayet'. We returned to the market area to have our tea and snacks and do a bit of shopping. There is a beautiful Ram Mandir have idols of Shri Rama, Sita and Lakshmana. Another temple of Hanumanji is exactly opposite the Ram Mandir. We took their blessings before returning to our hotel. 'AAI CHAAVLI' got a little excited yet again while we played cricket (ek tappi out) and hit the ball out of the hotel. As we had dinner of some mouth watering biryani, the topic of discussion were the couples hovering around. Mahesh knew exactly their plans, what they were thinking and saying even though they were metres apart from us - kudos to his hearing skills!! The sweet dish was 'Shahi Tukda' and it was awesome and we all had as many helpings as we could. Post dinner we went for a walk to the market and had paan. Back at the hotel, some of us played cards while others watched TV in the other room. Nishant, the sadist must have watched atleast 20 movies and millions of songs in a span of 2-3 hrs while we drank and gambled to glory. He didn't even miss out the Home Shoppe ads. And all this time Maheshs' attention was focussed on the adjacent room occupied by some other couples and he said he could hear voices which in the morning he confessed to be the sound of their AC - paaaathetic - Maybe he was missing Randhir who was busy with Nagesh...talk about swapping!! Finally we slept at around 3:30 am. Getting up after sleeping for a couple of hours, we decided against our plan to have an early morning walk through the forests to Alexander Point and then One Tree Hill point. We were more concerned about the Mega Block hitting the Central and Western lines and so walked to Dasturi Naaka at the earliest to catch a cab to Neral and then take a train back home. We saw some scenic spots, the scenery opening up as we walked to Dasturi Naaka. Some old local women carrying haystacks looked so surreal and made a picture perfect. Don't forget to have wada paav just outside Neral station. It's good!! By the way Andy won all the money at our game of cards followed by Sushant!! Thanks guys, hope you enjoyed it.....Travel safe..Travel more!! Twisted are the ways of the world!! Nice post with such beautiful photos. 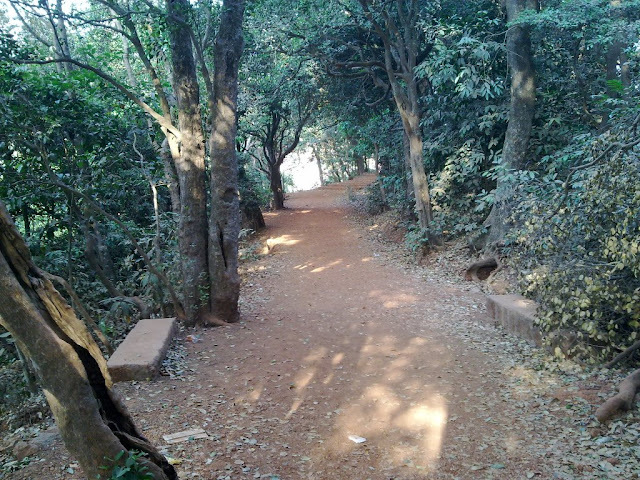 Matheran is a eco-friendly hill station situated on the Sahyadri range. Echo point,Sunset point, Monkey point, matheran toy train are the attractive points in matheran. Nice blog with awesome photos. There are many sightseeing points that attract the tourist. MTDC hotels in matheran are best place to stay. They have many self-contained rooms for accommodation and it is near from matheran station.know more about hotel visit matheanonline.com.